superb singing (Brendan especially) and lyrics; sounds like Brendan Perry "Ark" era solo vibe plus some stuff for Lisa thrown in. Yes, I have the double clear vinyl lp version, and it's always been noisy. Avoid. Crackling mentioned is very light on my copy. Doesn't effect the listening experience at all. My copy didn't have a download card, is that normal or is it just me that PIAS have cheated? I found the bass on the clear and green vinyl pressings to be bloated and not pleasant to my ears. Clarity also seems a bit muffled. Is the black vinyl pressing more of the same? I found a new copy of this today and just cleared through B1, absolutely pristine through this point. I'd expect nothing less from the rest. Having been a fan of the band since 1988's "The Serpent's Egg", I have always prefered their post-"Spleen And Ideal" sound, and have followed their proggress until after their "Into The Labyrinth" release, at which point I was reaching a different phase of musical research. 1) The production was much more lush than their previous "Spiritchaser" which was always a bit hit-or-miss for me, and seemed to echo that of "Into The Labyrinth". 2) The song writing seemed more straight-forward than some of their previous efforts which at times managed to explore less-linear song structures. 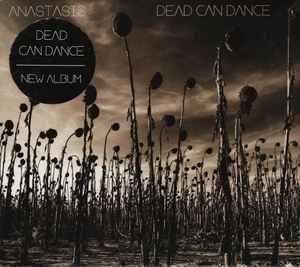 That being said, when I first listened to "Anastasis" I was instantly brought back to those late 80s and early 90s days when I was a fully dedicated DCD follower, and couldn't help but feel as though this was a return to their mid-period sound. Although (as it is the case with most DCD material unfortunately) most of the songs here have that distinct "recognizable" and "easy to predict" nature (see the review by A-day from January 29 2016), it is essentially a DCD record worthy of their name, and should appeal to fans (generally speaking) both old and new. ... and everytime I hear "Children Of The Sun" and "Agape" I feel like throwing all my intruments away, knowing I could never reach that level is sheer magnificience in production and songwriting. "A good deal of the edition has been reported to feature pressing faults (unremovable crackling/static noise), particularly on track B2 but also throughout other tracks. What percentage of the pressing is concerned or if the same applies to the US edition, is currently unknown." Awesome sounding vinyl release. I'm very impressed - completely different (more powerful) in comparison to the digital release. I have the same experience with this. I tried 2 sealed copies with the same bad pressing. I went for black vinyl version instead.